Original text: LE REMÈDE DE MIMI VÉRON apothicaire en chef du Constitutionnel. - Prenez....... prenez, il n'y a que cela qui puisse vous sauver! 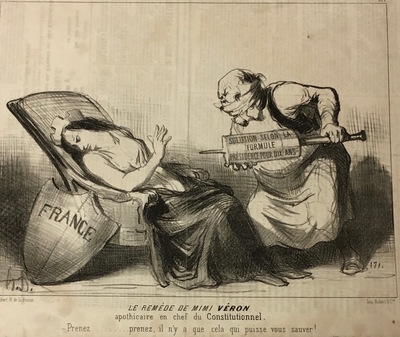 In this lithograph, which references the pharmaceutical world, an apothecary attempts to inject an enema syringe into France (personified by a female figure). The enema would allow President Louis Napoleon to stay in office for ten years, instead of four—which was then the limit set by the Second Republic Constitution. Included in the Honoré Daumier III: Law, Medicine, and Social Satire exhibition, 2018.